The cold has been at our house for the last few weeks, and when your throat is sore, there is nothing more soothing than a warm bowl of soup. I prefer something hot and sour but The Clone will go for anything soupy and creamy. This was her choice for lunch the other day. Out of the blue, she just said she wanted some carrot soup. I hadn’t made carrot soup before and I didn’t have time to look it up online or in a cook book, so I decided to make this one up as I went along. Heat the Olive oil and saute’ the garlic and onions until they are fragrant. Add the carrots and celery and cook for a couple of minutes. Add the broth and bring to a boil. Cook for fifteen minutes at a simmer until the carrots are soft. Season with salt and pepper to taste. Before serving, I used an immersion blender to puree the carrots and smooth out the soup. 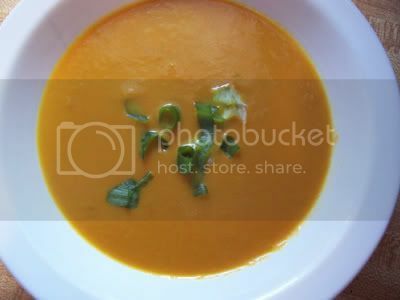 You can also use a regular blender to puree your soup. Just make sure you cover it loosely so that the heat won’t make the orangey soup explode all over your kitchen. Not like I’ve done that before or anything, I just heard it could do that. If you like you can also swirl in some cream at the last minute, but the soup was great without the cream or the extra calories.